Director – Rob Minkoff, Screenplay – John Fusco, Producer – Casey Silver, Photography – Peter Pau, Music – David Buckley, Music Supervisor – Adam Smalley, Visual Effects Supervisor – Brian Adler, Visual Effects – Macrograph (Supervisor – Junghoon Kim), Additional Visual Effects – Digiscope Inc, DTI (Supervisor – Jae Hwan Ryu), Footage (Supervisors – Dong-Hoon Lee & Jason Madigan), Frantic Films (Supervisor – Shane Davidson), Stingray VFX, Svengali Visual Effects (Supervisor – Rocco Gioffre) & Xing Xing Digital Corp, Special Effects Supervisor – Wang Ya Lin, Prosthetic Effects Supervisor – Mark Garbarino, Production Design – Bill Brzeski. Production Company – Lionsgate/Relativity Media/Casey Silver Productions/J&J Project Ltd.
Boston teenager Jason Tripitikas has a love of old kung fu movies. A street gang then force Jason to take them to the home of the old Chinese videostore owner that Jason rents the movies from so they can rob him. In the fight that ensues, Jason flees onto the roof with the old man’s bo staff but falls off. He wakes up to find himself back in dynastic China. The drunken Lu Yan tells Jason that the staff belonged to the legendary Monkey King. The Monkey King has been petrified by the cruel Jade Warlord who has taken control of the kingdom while the rightful ruler, The Jade Emperor, is in the midst of five hundred years meditation. Joined by the apparently immortal Lu Yan, who has great martial arts skills but only when he is drunk; the seldom speaking Silent Monk; and Golden Sparrow who wants to kill the Jade Warlord in vengeance for the death of her parents, the group set out to Five Elements Mountain to return the staff and revive the Monkey King. 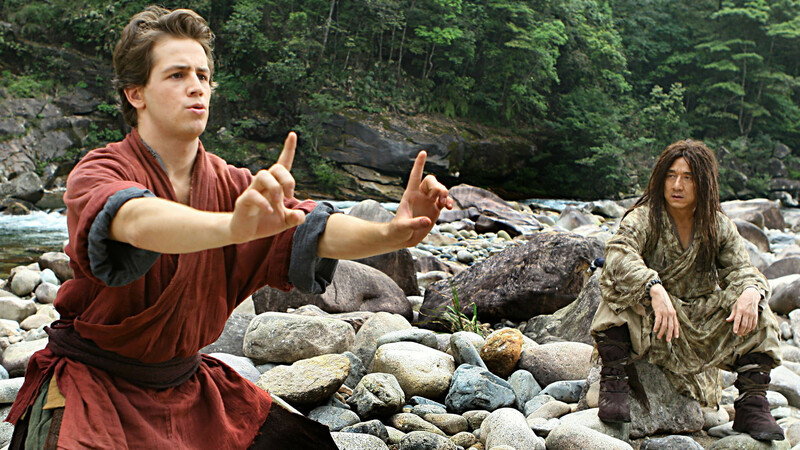 However, in order to complete the journey, Jason must learn to become a martial arts master. It’s official – China is the new black. All of a sudden in 2008, China moved from an authoritarian Communist state with one of the worst human rights and environmental records in the world to somewhere that is suddenly cool. Of course, 2008 was the year of the Beijing Olympics and the world spotlight was on it. Seemingly in recognition of this, a number of Hollywood films placed their focus on China. In 2008 alone, we also saw the animated Kung Fu Panda (2008), as well as the third in the Mummy series The Mummy: Tomb of the Dragon Emperor (2008), which moved the locale from Egypt to China. (Indeed, in the city where I lived at the time, Tomb of the Dragon Emperor opened one week after The Forbidden Kingdom and in the weeks before, the two trailers ran alongside one another in theatres and it was frequently confusing trying to tell the two apart). The Forbidden Kingdom comes from Rob Minkoff, a former Disney animator who started out directing Roger Rabbit shorts and then co-directed The Lion King (1994), before making his live-action debut with Stuart Little (1999) and going onto Stuart Little 2 (2002) and the Disney theme park adaptation The Haunted Mansion (2003) and subsequently returning to animation with Mr. Peabody & Sherman (2014). Even more interestingly, The Forbidden Kingdom has a script from John Fusco, a writer who has constantly focused on matters Native American, Western and horse-related with scripts for films such as Young Guns (1988), Thunderheart (1992), Spirit: Stallion of the Cimarron (2002), Dreamkeeper (tv mini-series, 2003) and Hidalgo (2004), as well as the odd genre outing like Crossroads (1986), Loch Ness (1996), another equally embarrassing venture into Wu Xia cinema with Crouching Tiger, Hidden Dragon: Sword of Destiny (2016) and The Shack (2017). The Forbidden Kingdom was pitched as an adaptation of the classic 16th Century Chinese epic legend Journey to the West. Journey to the West concerns a quest to India from China by the scholar Tripitaka, accompanied by the mischievous Monkey King and his two companions, to retrieve some Buddhist documents. Along the way, they encounter various demonic forces and comic figures. Journey to the West has been filmed a number of times, most notably as the Japanese film Monkey Sun (1940); the Chinese animated Princess Iron Fan (1941); the Chinese film Princess Iron Fan (1941) based on a partial segment of the story; the Japanese film Songoku: The Road to the West/The Adventures of Sun Wu Hung (1959); the Japanese animated Alakazam the Great (1961); the Chinese animated film The Monkey King: Uproar in Heaven (1965), which is the best adaptation of the story to date; a trilogy of live-action films from Hong Kong’s Shaw Brothers Monkey Goes West (1966), Princess Iron Fan (1966) and The Cave of the Silken Web (1967); the popular the Japanese tv series Monkey (1978-9); a South Korean tv series Journey to the West (1982); a Japanese tv series Journey to the West (1993); director Jeffrey Lau’s two-part Hong Kong film A Chinese Odyssey Part 1: Pandora’s Box (1994) and A Chinese Odyssey Part 2: Cinderella (1995) with Stephen Chow as Monkey; a Japanese anime tv series Monkey Magic (1998); the US tv mini-series The Monkey King/The Lost Empire (2001) starring Thomas Gibson; the Hong Kong tv mini-series The Monkey King (2002); Jeffrey Lau’s remake of his earlier work A Chinese Tall Story (2005); a Japanese tv series Saiyuki (2006), which had one film spinoff with Saiyuki (2007); the modernised Emperor Visits the Hell (2012); Stephen Chow’s Journey to the West: Conquering the Demons (2013) and its sequel Journey to the West: Demon Chapter (2017); The Monkey King (2014) starring Donnie Yen and its sequels The Monkey King 2 (2016) and The Monkey King 3 (2018) with Aaron Kwok; and the Chinese animated Monkey King: The Hero is Back (2016). That said, despite its claims, The Forbidden Kingdom is not actually based on Journey to the West. Monkey King does feature as a character and there is a journey to a sacred mountain (to return rather than obtain a sacred artefact) – even a hero named Tripitaka (although a fan of kung fu movies hardly counts as the equivalent of a Buddhist scholar). However, Monkey King spends most of the film in frozen stasis; he is bereft of any of his companions; there is no mention made of Buddhism anywhere in the film; and, as the end tells us, Monkey King’s journey is yet to come ie. what we have is at best a prelude to Journey to the West. In fact, what we have with The Forbidden Kingdom, is a film that feels more like a version of The League of Extraordinary Gentlemen (2003) – but using characters from classic martial arts/Wu Xia films rather than Victorian fiction. There is the character of Monkey King whose appearance has even been based on the makeup in the classic Monkey tv series; someone who is at least named Tripitaka; there is Jackie Chan reprising his role from the Drunken Master series; there is Bingbing Li as the eponymous character from The Bride with White Hair (1993) and sequel; while Yifei Liu plays Golden Swallow, a character who appeared in Come Drink With Me (1966) and several other classic martial arts films; and the character of the elderly monk with severe white eyebrows that appeared in numerous Shaw Brothers films played by various actors. There are many references to martial arts films throughout – like Seann William Scott in Bulletproof Monk (2003), Michael Angarano’s character seems to base his martial arts on an absorption of kung fu movies (and videogames) rather than any actual training. There is even an opening credits sequence made up of a montage of posters from classic Shaw Brothers kung fu films. I failed to find any great enthusiasm for The Forbidden Kingdom before watching it. However, when I saw what it was trying to do with the classic characters, the idea seemed to hold a good deal of promise. Much has been poured into the film. 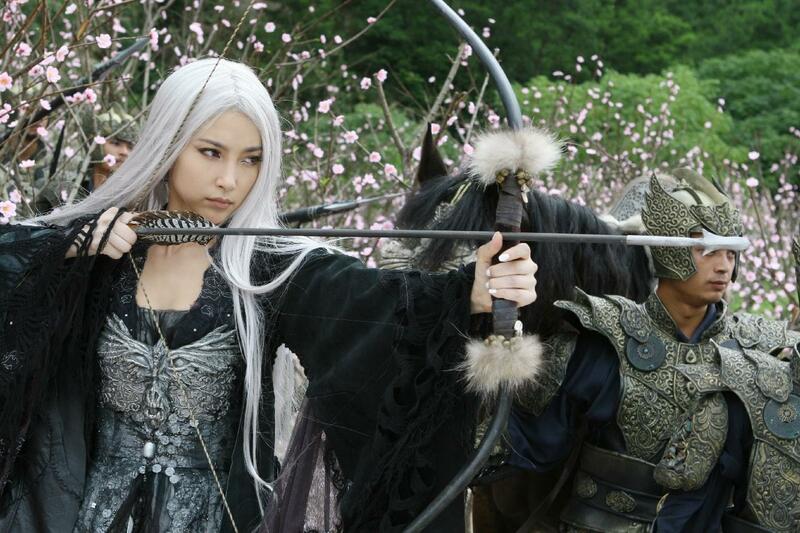 The entire production went to shoot in mainland China. It has been billed as the first onscreen pairing between Jet Li and Jackie Chan, the two most famous Hong Kong/Chinese actors in the world. Yuen Woo-ping, the legendary martial arts coordinator/director who gained fame as the fight coordinator for The Matrix (1999), has been brought on board and directs the martial arts sequences, as well as takes as an executive producer role. Only, The Forbidden Kingdom arrives on screen with all the warmed-over whimper of a junior-grade martial arts tournament. The martial arts sequences should have burnt the screen away – as they did when imported to the West in The Matrix – but here they seem formulaic and produced without enervation. Jet Li and Jackie Chan meet up onscreen in a fight sequence but it is a sequence that is entirely lacking in the promise of such build-up, not to mention fails to hold a candle to the body of work in the martial arts genre that either actor is known for. Watching their on-screen confrontation has about all the excitement of the graphics for a tv news show – it is just stunt coordinators and visual effects people, not two characters fighting. The same could be said for every single fight sequence in the film. If only they had let Yuen Woo-ping direct rather than sit as a producer, as opposed to giving the film to a director like Rob Minkoff who is only known for his soft-headed family fare, The Forbidden Kingdom might have been a classic. The criminal failing of The Forbidden Kingdom is that it has Westernised Wu Xia cinema. While most classic Hong Kong kung fu films are about adventure and skill, the problem that all Western attempts to copy these have had – from Big Trouble in Little China (1986) and The Golden Child (1986), through Bulletproof Monk, Monkey King, Wendy Wu: Homecoming Warrior (2006), Kung Fu Panda and this – is that they recast the films with Western faces. Moreover, they all make a play on the comic disparity between popular Western and traditional Eastern cultures. However, in allowing the white faces to invariably win out, they cannot help but seem to be about the eminent superiority of one culture over the other. The only Western effort to dig any deeper than this was the exceptional tv series Kung Fu (1972-5) with David Carradine. Here the glorious exploits of Monkey and the various other classic kung fu characters have been banalised – while The Forbidden Kingdom is billed as an adaptation of Journey to the West, Monkey King barely gets to appear. Even Jet Li and Jackie Chan are supplanted by a pimply American kid who would not even last five minutes in a classic Shaw Brothers film. Indeed, the film’s greatest crime is that it has supplanted the feats of the Drunken Master, Golden Swallow, the pairing of modern martial arts stars Jackie Chan and Jet Li, not to mention Monkey King who has been enjoyed by people for 400 years, with a snot-nosed kid whose name will not even be remembered by audiences by the time they leave the theatre.